An Hermetic Origin of the Tarot Cards? First published in the Hermetic Journal 1983. 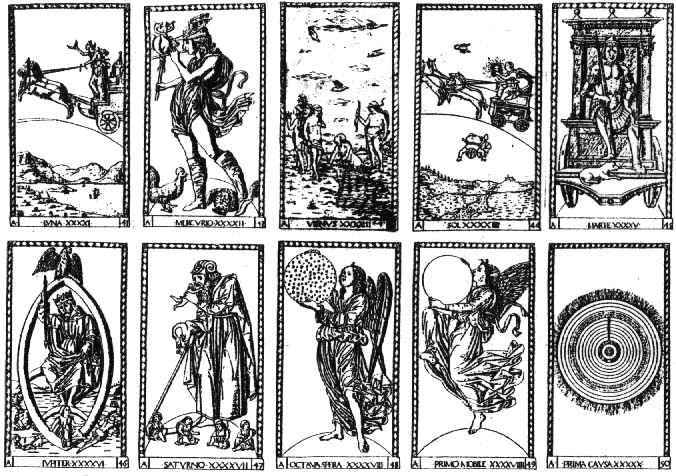 It has become almost universally accepted as the received wisdom of the Western esoteric tradition that the tarot card images embody a system derived from the Jewish Kabbalah. This view seems to derive from the mid-nineteenth century French Occult revival, and particularly was promulgated by Eliphas Levi and later incorporated through Westcott, Mathers and Waite in the teachings of the Hermetic Order of the Golden Dawn from which our twentieth century tradition of occultism has been derived. Other esotericists have even tried to link the tarot images back further into Egyptian iconography and suggest that the Jews may have received this esoteric system during the time of their stay in Egypt. In part this association of the tarot with Jewish esotericism lies in the fact that there are 22 major arcana cards in the modern tarot pack and this parallels the number of letters in the Hebrew alphabet, which lies at the heart of the Kabbalistic system. 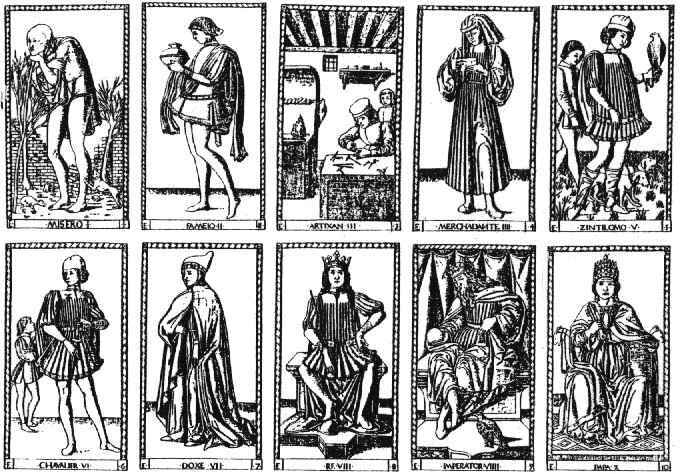 The symbolism of these cards, or perhaps we should say 'emblematic figures', would seem to derive from the Hermetic tradition which is now recognised as underlying the Italian Renaissance of the mid-fifteenth century. It was during this period that the Platonic Academies of the Medici's were set up and Ficino and other scholars began translating texts such as the Corpus Hermeticum and the works of Plato, some of which were brought to the Court of Florence from Constantinople by Gemistus Plethon (c.1355-1450), a Greek scholar who was probably an initiate of a 'Platonic' Mystery School in the East. This reconstruction of hermetic and neoplatonic esotericism is reflected in such ideas as the Muses, the Liberal Arts, the Cardinal Virtues, and the Heavenly Spheres, and it is my view that the Tarocchi of Mantegna should be seen as an 'emblem book' of this hermetic current. 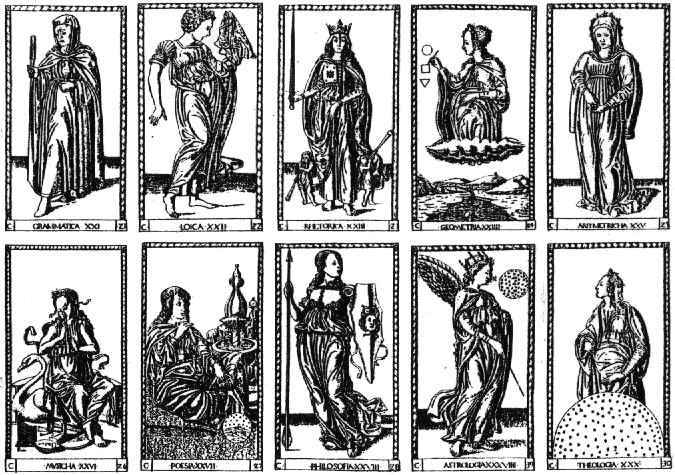 The fact that its designs show parallels with the later tarot decks should therefore be of the greatest interest both to students of tarot and of Hermeticism. There is in this sequence both a reflection of the social conditions of humankind and also the stages of an inner development, from the lowly 'beggar' state of soul, to the fully spiritualised 'Pope' facet of the soul. Interestingly, these fit well onto the tree of life diagram corresponding to the sephiroth quite tightly, but can also equally well be tied symbolically to the Pythagorean 'Tetractys' or pyramid. 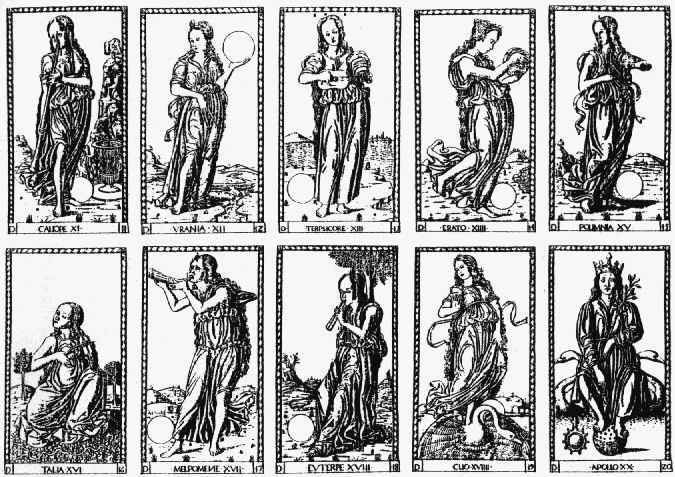 The second decade consists of images of the nine muses and Apollo. These muses preside over certain arts and instruments of these arts. This group represents the archetypal sources of creative inspiration for the soul, and these muses work in the realm of the imagination. The soul can draw upon these ten different inner spiritual resources for its inspiration and transmutation. This group are the archetypes that work behind human thinking. The fourth decade consist of the seven Cardinal Virtues appearing as female figures together with three Spirits (or Genius') of Life (or the Sun), Time and the Cosmos, these being shown as male Angels, each carrying a symbol. 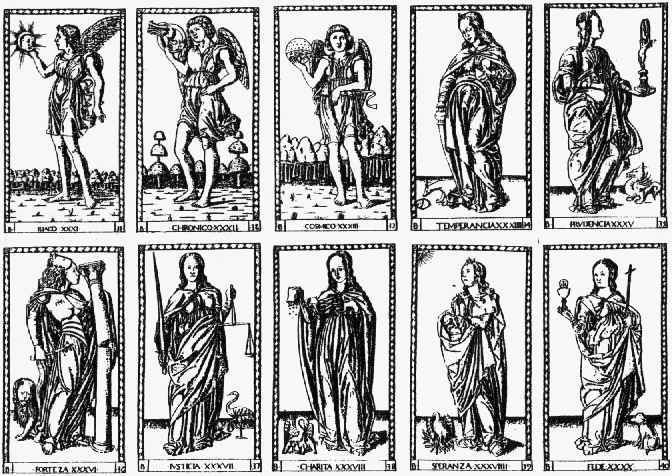 The seven Cardinal Virtues also have animal figures beside them. These represent that which works in the higher soul of humanity as the virtues dwelling in the conscience. As the aspiring soul develops towards inward perfection, rising to an awareness of the spiritual genius behind the life force (the Sun), Time and Space, then there will inwardly develop from the seed of conscience rooted in the soul, the Virtues, which will unfold and grow from within to express themselves in ones outer actions. The final decanate is that of the heavenly spheres - the seven planets and the three higher spheres each having a symbol. This represents the highest spiritual principles working as the planetary forces behind all the aspects of the world. So we have here the cosmic spheres of the fifth decade representing the Macrocosm and the first decade being a kind of reflection of this in the Microcosm, while between these two polarities are found the Muses, Liberal Arts and Cardinal Virtues, the channels through which the soul experiences the archetypal powers lying behind its feeling, thinking and willing, and can thereby develop its imaginative, intellectual and spiritual gifts. This reflects the Renaissance ideal propounded in the Neoplatonic academies which inspired artists, writers and musicians, and brought great works of the creative human spirit into being which transformed the outer restrictive social forms of the medieval period and gave a new impulse of freedom to the spiritual seeking of humanity. So it should be obvious that these cards and their symbolism arise out of a Neoplatonic and hermetic current, but they should not be seen as entirely limited symbolically to this period or set of ideas. For this very early Tarocchi of Mantegna designs, through reflecting this hermetic system of ideas also may have provided the archetypal forms for some of the later and more familiar tarot packs. We note certain obvious parallels. So could it not be that our present day tarot cards should perhaps be seen as arising out of the hermetic ideas at the foundation of the Renaissance, rather then from the Jewish Kaballah? I believe this view requires, indeed demands, some attention, even though it might upset the established and ingrained ideas of twentieth century occultism.